So um, this is my 1st submission to Minitokyo. Basically I'm just your average newbie. Lol. So pls bear with my simple amateurish works. And I wasn't sure which category this goes in cos it's not doujinshi or abstract art and the only one left was vector art. The only part that was vectored with the pen tool was the lineart. The rest was painted using brushes (so this isn't a complete vector, rite?). I know it's cheesy to put her name there but I thot it was plainer without. I'm a huge fan of the tsubasa manga so I coloured her hair orange rather than brown. Hehe. Yay, thx for the comment and fav! Really appreciate it. Yeah, I love the manga and S+S. I started learning photoshop because of them ;P Weird huh. Think it's become an obsession. Haha. Thx for the fave and comment! 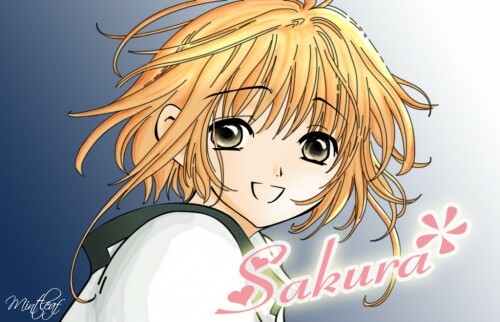 wow,nice,one of my faves but shouldnt sakura's eyes colour be in green? Quote by sakuras-angelwow,nice,one of my faves but shouldnt sakura's eyes colour be in green? Eeps...is it not green? When I painted it, it was, though it's not jade green like in CCS. I picked the color from a manga scan too. I know my laptop's color is a bit off (cos when viewing the same pic in another comp the color changes to hv a more yellow tinge)...but......*starts panicking* is it not green? and thnx for the fave and comment! thats a really good vector, especially for a first post, well done! ^^ and yes the thing about the eyes have already been said ^^ keep up the great work! nice work, esp for your first vector ^^ I esp like how you did her hair and her eyes :) Though the shadows on her shirt looks a bit wobbly. anyway, keep it up! Quote by MapleRosenice work, esp for your first vector ^^ I esp like how you did her hair and her eyes :) Though the shadows on her shirt looks a bit wobbly. anyway, keep it up! Ahaha! Oops. Ok, thx for the tip! I was wondering how ppl usually replied others' comments. ^_^' This is the last post I'll reply to this way, k.
Abt the work, actually it's my 2nd vector...the 1st one's not colored so I can't put it up jus yet. Hehe. Thx for the comment! Her smile, I LOVE HER SMILE! i CCS her smile can send Syaoran running to the hills blushing red like a tomato! i kinda miss that cute reaction..
i hope that we'll be able to see more smiles from Sakura and Syaoran as well! excellent work for a first go!